In the Saturday April 13, 2019, hearing of the case, the AG said there was no need for the court to descend into the political arena and pointed out that the Leader of the Opposition, Marlon A. Penn (R8) tried to raise the matter in the House, but was denied because he had breached the Standing Orders by not giving the required 7 days prior notice. 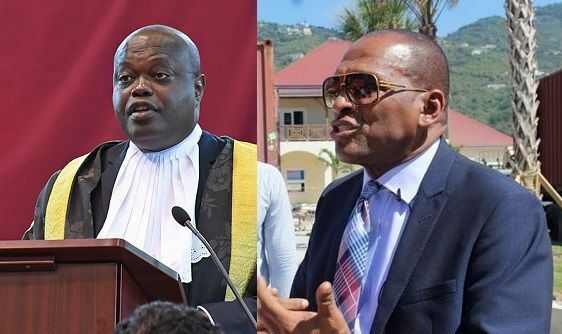 According to arguments raised by Mr Ramlogan—head of the legal team representing the Speaker—a Member of the House (MH) is elected when the Supervisor of Elections certifies who the successful candidate is with the majority of votes. This is done by the “return” which announces the winner as an elected MH can, in fact, resign before a Speaker is appointed and before he takes the oath as this simply entitles him to participate in the proceedings of the House but does not confer the status of an elected member, the argument states. With that, Mr Ramlogan asked the court to reject the position taken by Mr Vanterpool which was supported by the AG, to the contrary that the status of an elected MH arises only after a Speaker has been elected and the oath has been administered. According to him, this was illogical and misconceived because it meant an MH who was disqualified from serving as an MH immediately after the General Election, would be unable to resign or vacate their seat. Mr Ramlogan gave some powerful and thought-provoking examples that produced much laughter in court. He asked what would happen if the day after the election, the successful candidate was declared insane. “Would the people have to be represented by a madman until the Speaker was elected to administer the oath?” he questioned. He gave further examples of the successful candidate being declared bankrupt or convicted for a criminal offence and wanting to resign, querying whether they would be unable to vacate their seat until the Speaker was appointed. The court was told that the fundamental flaw in the arguments from Mr Vanterpool’s Attorneys and the AG lies in the assumption that a Speaker would soon be elected after the elections. There were numerous examples in political history where this did not happen for prolonged periods which would mean that the disqualified MH would be able to remain in office and draw a salary until the Speaker was elected, he said. 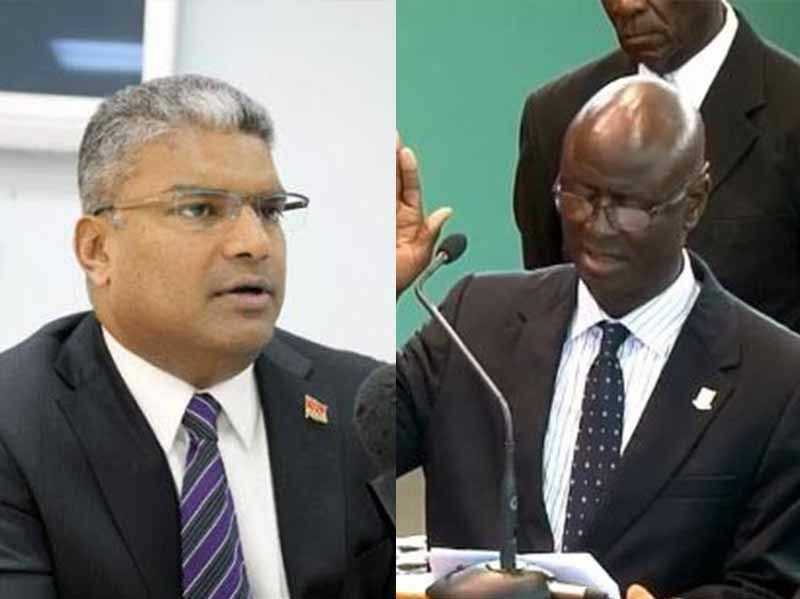 Mr Ramlogan further cited a Trinidad example where there was a tie after the 2001 General Election and a Speaker could not be elected for some nine months. There were examples of hung Parliaments where the political configuration was such that they could not agree on a Speaker and Parliament was unable to convene for an MH to take their oath for a very long time. Mr Ramlogan took the AG to task because for his submission that Mr Vanterpool’s resignation was a matter for the House. He further noted that Mr Vanterpool’s Attorneys adopted the AG’s submission in total and were hence equally saying that this matter could be dealt with by the House. Why did the AG not himself raise the matter in the House since he was a member with special privileges, he questioned. 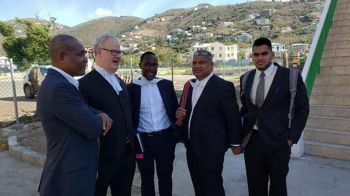 The Judge was invited to dismiss the claim and remit the matter to the House in light of the AG’s position which was supported by Mr Vanterpool. Take it to the house and the majority votes against Hon Vanterpool, thsts why we need a strong opposition, on thursday, the people of the 4th gets whst they need, which is the return of HON. MARK VATERPOOL! The AG had he secret meetings with the NDP the day after Mark resign. So he need to go siddown Andrew needs to get a new AG. This one is a damn c***. You mean the same NDP who did not like him and did not want to renew his contract because he would not defend their assishness with BVI airways and several other matters? Stop chatting piss!! See mr ramlogan has sense and sees it exactly like I see it. I think the AG was thinking of the personality involved and not the position...and that is not what is done. The AG compromised himself and puts his unbiased judgement into question.. Mark will lose this case. The AG can resign and see if he would get his job back. If I was the AG I would tender my resignation immediately after the verdict. Show some integrity and ethics. Was the matter not brought to court at the invitation of the speaker? If I were Mark I would not have taken the matter to court in that there can be no bi election unless the govenor approves such. The governor and the AG do mot agree with a bi election so I would have just sit and wait to see how AG, govenor and speaker work the matter out. If anything I would be spending time reassuring the 4 th district electorate that I do have an interest in representing them. The next move was not Mark's to make and he should have waited things out. Sometime After the HOA was dissolved I saw the AG or someone that looks a lot like him basically identical entering the building where Infinite Solutions is shortly followed by the former Minister of Education. This was after the HOA was dissolved when everybody was in campaign mode. It could just be lawyers being lawyers but The AG has been around NDP too long and may have developed a liking to them. That lawyer is a boss! Very good points brought forward. Lol; I am liking Mr Ramoigan style. He just killed Mark case. No way Mark getting sworn into HOA. This going right back to the HOA for action. BTW; how come the AG giving evidence for Mark? Does he not work for the government? I would think the AG should be neutral but it look like the AG is NDP. What a mess! We need a new AG. The speaker lawyers are so so correct. Mark Vanterpool at the time of resignation was an elected member. He resigned from such post and in so doing rejected the votes of the people of district 4. I am glad for the change in Government.. But Mark won his seat... All this isn't necessary. The government already change seating Mark won't make much of a difference. Just unnecessary spending and fighting giving 20 gran plus useless money to lawyers... All the example and references the speaker lawyer made are irrelevant.. Mark won. There is no tie.. He is not Crazy and the selection of a speaker would have happened. Just that the house didn't convene to select.... The clerk return mark letter to him and said it was addressed to the wrong authority. Resubmit it to the proper authority. Then he changed his mind. What did Mark did wrong? . How about if the clerk had reply and said resignation accepted?.. I Pray Mark win his case.. I think the AG and the governor are correct... This is very sad..
Trial gone hi tech. Trial by the bloggers and the internet. News casting is not the same as it was in the past. Once information is in the digital format it goes viral. Mark resignation is viral and the opinion of the entire world community is logged in. This trial will set a precedence for the electoral process in the VI if not for the entire Caribbean. Opinion: Voters hold your political representative to their word and make sure they honor the trust you put in them. Time to go back to the poles and fix this mistake. The Governor must be mindful of not having a representative for the capital city of Road Town at any cost. No representative can be allowed to hold a district hostage. The AG very well knows the constitution falls short in this type of scenario and that one cannot apply the literal meaning of the law when the circumstances are completely different, so you must look to the spirit of the law!!! !